I like to pretend that I'm a selfish knitter, meaning I only knit for the 'knit-worthy' - those that would both help you move a body and truly understand the craft and time and love that go into hand-knits (and quilts, for that matter). The idea rose as a backlash against that jerk acting like they are doing you a favor by requesting that you make them something and that other jerk that informs you that you can buy socks already made at Walmart. Very helpful. I lack the discipline to be 'selfish' and instead foist projects that took me days, weeks, months on completely unsuspecting people. The obvious amount of energy that goes into the projects lays there like threat - reject this and you reject me. It's gift-giving emotional one-upping. "Oh, it's no big deal. I just spent 30 hours working on this, stitch by stitch. Thinking about what you'd like. Fretting that you wouldn't want this. Reflecting on how you're important in my life. Nothing major. It's no Best Buy gift card or anything." It's a bit unfair, really, because even I would rather get the Best Buy gift card. My interest in wearing the things I make dies about four days after I complete them. Perhaps, the truly selfish approach is to leach inspiration from those around me, so I can induldge in a hobby I enjoy while pretending I'm giving a one-of-a-kind masterpiece that will be cherished for decades. This pattern was the request of an old friend to replace a scarf I'd made him years and years ago, when I'd just started knitting/crocheting. I have always been a little 'meh' about that scarf (though apparently he loved it - always a sign of the knit-worthy) so I jumped on this as an opportunity to redeem myself. His request was "long, dark red and textured". It all fell into place from there. Red yarn that just happened to be named "Pagoda" when he'd just so happened to spend some time in China and a stitch pattern that just so happened to look like roof tops, and here we are - Mao's Little Red Scarf. This pattern is ridiculously easy and a pretty quick knit for a scarf. 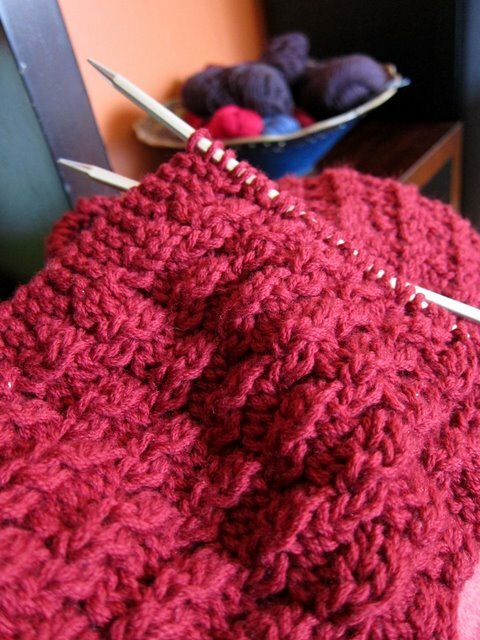 You need to know how to knit, purl, cast on and cast off, so it is very beginner friendly. Cable cast on 35 sts. *K3, slip next 5 sts with yarn in front*, repeat from * to * until last 3 sts, k3. *K3, p5*, repeat from * to * until last 3 sts, k3. K5, *pu, k8, repeat from * to * until last 6 sts, pu, k6. Repeat pattern until scarf measures 60" or length desired. 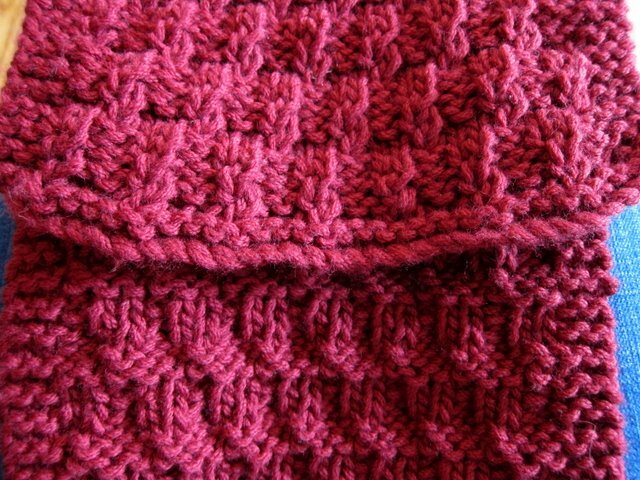 Make pucker: Pick up stitch from 10 rows below and knit together with one stitch on the left needle. Seed stitch: K1, p1 for the whole round. (On the second round, you'll knit into purl stitches, and purl into knit). Slip marker as you come to it. Cable cast on 125 sts. Join, being sure not to twist.Place marker to note start of round. Work 1 inch in seed stitch. This is my Dine & Dashing hat and scarf. I am using this pattern to raise money for Harvesters, the Kansas City foodbank. Demand is up quite a bit this year and donations have dropped, so I'm hoping my knitting skillz can help. This is the first time I'm offering a pattern for sale. You can purchase it here. I made the originals for a co-worker's wife for Christmas. Rumor is, she was a fan.